They've got wide ripples and are quite crisp. There's quite a bit of variation in appearance from chip to chip — some have lots of red on them from the flavor powder, while others are more yellow in color. I couldn't really correlate a taste difference with the differences in color, though. They all have a nice, subtle ketchup flavor. It's far less intense than many other ketchup chips — I'd recommend Wachusett Ketchup Chips if you want something more ketchupy. 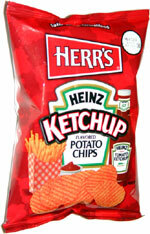 Smell test: These smell just like Heinz ketchup. 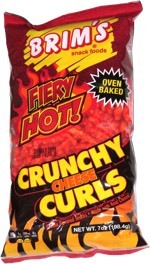 This snack was discovered by Jeremy at Tebo's Mini Market, Warren, Massachusetts.